Flags used in the classifieds. Definition at line 35 of file llclassifiedflags.h. Definition at line 69 of file llclassifiedflags.cpp. Definition at line 52 of file llclassifiedflags.cpp. Definition at line 64 of file llclassifiedflags.cpp. Definition at line 44 of file llclassifiedflags.cpp. 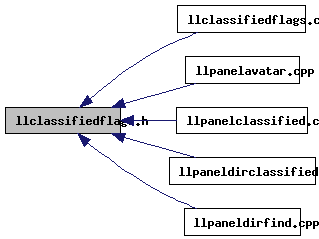 Referenced by LLPanelDirFindAllOld::onClickSearch(), LLPanelDirClassified::performQuery(), and LLPanelClassified::sendClassifiedInfoUpdate(). Definition at line 42 of file llclassifiedflags.h. Referenced by is_cf_auto_renew(), and pack_classified_flags(). Definition at line 38 of file llclassifiedflags.h. Referenced by is_cf_mature(), and pack_classified_flags(). Definition at line 37 of file llclassifiedflags.h. Definition at line 41 of file llclassifiedflags.h. Definition at line 45 of file llclassifiedflags.h. Definition at line 44 of file llclassifiedflags.h. Definition at line 46 of file llclassifiedflags.h. Definition at line 48 of file llclassifiedflags.h.